There is so much bad news being reported in the world, so everyone needs a feel-good story now and then. One that recently caught our eye was the recovery of a starving sea lion pup that made its way into a fancy San Diego restaurant just off the beach. The underweight and dehydrated female pup was found asleep in a dining booth and is now reportedly recovering nicely at Sea World. If all continues as planned, the sea lion pup should be released to the wild in the coming months. Banks too could use a picker-upper around now, given the stock market's recent swoon and mounting concerns about where the economy may be headed. Accordingly, the National Small Business Association's (NSBA) 2015 Year-End Economic Report is worthy of a discussion. It's a positive sign for small businesses that the percentage able to obtain adequate financing reached an 8Y high of 73% in Dec vs. 69% just six months earlier. Further, the study recorded a slight uptick in the percentage of small businesses using bank loans to meet their financing needs over the past 12 months. This information, combined with other lending data, also shows a slight easing in credit standards given such extreme competition for small business clients. Also worth noting is that small businesses reportedly used online or non-bank lenders only 3% of the time to meet their capital needs over the past year. That's up slightly from previous quarters, but only a sliver compared with the percentage of those seeking bank loans. This is good news for banks that have been inundated with reports about being thrown from their perch by an onslaught of financial technology alternative lenders. Certainly the percentage of small businesses working with non-banks is rising, but so far, the competition seems more than manageable. There are several takeaways to glean from the NSBA statistics. For starters, banks have to continue doing all they can to help small business owners meet their capital needs. This is true whether that's through loans or even bank-branded small business credit cards with preferential rates and favorable terms. Nearly 20% of small businesses reported an increase to their lines of credit or credit cards, the highest this indicator has been in 6Ys. Second, given the competitive landscape, community banks should continue to focus on what you do best and provide top-notch service to small businesses. Next, don't be shy. Know that small businesses need frequent reminders that you are on their side so stay vocal and keep ramping up the communications. It is critical to maintain close contact with customers so they understand you are interested in developing long-lasting relationships. Finally, consider how important it is to keep talking to small business owners to educate them on the banking industry. Research by invoice factoring company BlueVine here finds 75% of small business owners rely on personal finances as their primary source of business funding and 83% have put their own money into their business. Helping ramp up the education can deliver back loan business and strengthen relationships, so keep working on it as you push onward and upward. 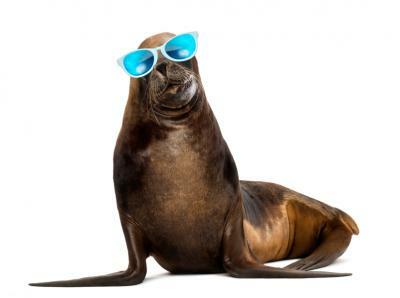 Just as caregivers have been nursing the lost sea lion back to health, community banks are perfectly positioned to help give small businesses the financial tools they need. Doing so will help your clients and soon-to-be clients not only survive, but to thrive. Treasury yields rose 3bp as oil continued to rebound. 1) Summit Community Bank ($1.5B, WV) will acquire First and Citizens Bank ($127mm, VA) for about $21.8mm in cash. 2) Community First Bank ($234mm, WI) will join with Livingston State Bank ($166mm, WI) in a merger of equals for an undisclosed sum. 3) Morton Community Bank ($3.1B, IL) will acquire Heritage Bank of Central Illinois ($266mm, IL) for an undisclosed sum. 4) TBK Bank, SSB ($1.6B, TX) will acquire Colorado East Bank & Trust ($758mm, CO) for about $70mm in cash, or roughly 1.3x tangible book. Banking regulators will no longer require appraisals on real estate loans less than $250,000; nor are appraisals required for certain renewals, refinances, or other transactions involving existing extensions of credit and real estate-secured business loans with a transaction value of $1,000,000 or less when the sale of, or rental income derived from, real estate is not the primary source of repayment for the loan. Regulators remind bankers that there may be instances when a financial institution finds it prudent or necessary to go beyond the requirements of the agencies' appraisal regulations, however (i.e. obtaining an appraisal may be prudent for credit risk management purposes or may be a prerequisite to participating in some secondary market transactions or when the bank's portfolio risk increases or for higher risk real estate-related financial transactions). Research by RealtyTrac finds the percentage of homes that were bought and sold within 12 months (i.e. flipped) soared to 5.5% of all homes, reaching a 10Y high. A National Association for Business Economics survey finds 80% of economists say they expect the Fed to hike rates at least 1 more time this year (39% expect 2 hikes, 24% expect 1 hike and 17% expect at least 3 rate increases). The CFPB said it has identified equal access to small-business loans as one of its nine top priorities over the next 2Ys. The CFPB said it plans to build up its infrastructure and internal teams so it can accept and analyze small business lending complaints. Research by the Consumer Federation of America finds: about 33% of women said their savings progress was "good" or "excellent" vs. 44% of men; and 45% of women said they put at least 5% of their income into savings vs. 54% of men.